Throughout our years living in China, we’ve held just about every teaching job imaginable. As such, we’ve put together a rough guide based on our experiences. If you’re considering moving here to teach ESL, this is for you. Get an overview of each type of job, as well as typical working hours, pros and cons, holidays, and salary. 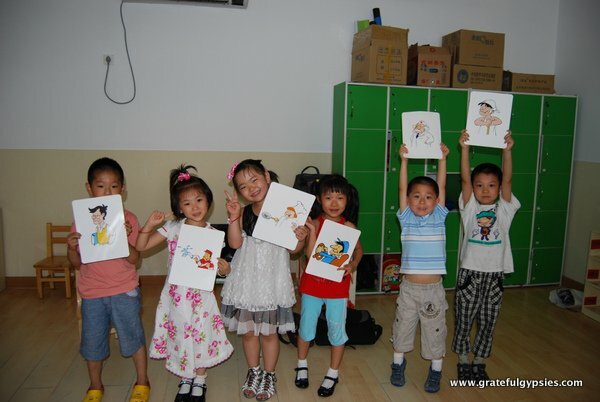 A typical Chinese kindergarten class. Overview: If you like kids, singing, and dancing, and just generally acting like a clown, then a kindergarten could be a great place for you to work. These jobs are the most readily available with different options for full or part-time. Working in this type of job, you typically work from 8-11, have a long lunch/nap from 11-2, and then work again from 2-5. You are there mostly to train the kids not to be terrified of foreigners, to teach them basic vocabulary, sing songs, play games, and run around outside. You should have at least one Chinese assistant to help you manage the classes here. The children are adorable and it’s a lot of fun, but it can be draining at times, and you often feel more like a babysitter than a teacher. That being said, it’s quite easy to find part-time jobs doing this just a few days a week, which is a good way to pad your income from another job. Kids are gross. They drool, pick their nose, pee their pants, and so on. Materials: You use a lot of flash cards here, as well as games, songs, and all that stuff that kids love. Visa: It’s possible to get a working visa if you work full-time in a kindergarten. For working in kindergartens, you’ll be required to do a health check and take an STD test before getting a visa. Holidays: You’ll have long summer and winter holidays, as well as Chinese public holidays, but probably no other vacation time. Overview: Working in Chinese primary schools can be a lot of fun. The children look forward to your class all day because their Chinese teachers tend to be strict and do things really by the book, whereas you have a lot more freedom as their ESL teacher. You tend to meet with each group for about 45 minutes once or twice a week, and you can do activities in their textbook mixed in with some fun games, songs, etc. You will still have a Chinese teacher around to monitor the class here. The main requirement here is that the children like you and your class. If you are boring and no fun, they will complain to their parents, who will complain to the school, who will replace you. Don’t take your job too seriously here and try to have some fun. Materials: Students will follow a textbook in your class, and some classrooms have a computer/projector that you can use to make PowerPoint lessons. Expected Salary: This really depends on the organization that gets you in the door, as some take a bigger cut than others. In general, the lowest you should accept is 6,000 RMB/month for part-time and 10-13,000 RMB for full-time. Visa: You’ll most likely be working for the school through a company, so it’s on them to get you a visa. Overview: By middle school, most students should have a pretty good level of English. At this stage, your main job is getting them active in class and speaking English to each other. Of course, with children at this age, keeping the classroom from being a total nuthouse is the number one job of the teacher. In most middle schools, the Chinese teacher will use the ESL class as the time to go drink tea and have a rest, so it’s on you to manage the class yourself. When I taught in a middle school, I often played pop music or watched cartoons with my students, and they loved it. Expected Salary: Similar to primary school, it all depends on your organization. Expect 200-300 RMB/hour for part-time work and at least 10,000/month for full-time. Overview: Jobs teaching ESL in high schools here are few and far between. That’s because, for the most part, Chinese high schools forget about English for a few years and just focus on getting students ready for the college entrance exam. The exam, called Gao Kao in Chinese, will be without an English section entirely in the coming years. As for the English that’s on there, it’s mostly grammar and vocabulary and is taught by Chinese teachers. Overview: When it comes to university jobs, you’ll most likely be their Oral English teacher. Chinese teachers help the students in grammar, listening, and writing classes, so it’s your job to get them speaking. Of course, at this age, most students would rather text away on their phones, play video games, or simply sleep, so the hardest thing to do is keep them engaged and motivated. 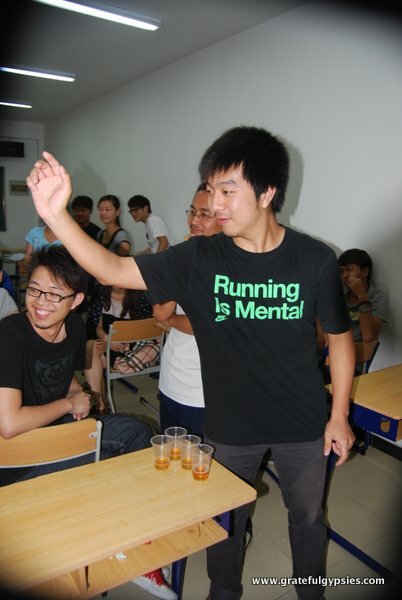 In my experience, though, I’ve had a lot of fun teaching in universities. You are given a lot of freedom as their foreign teacher, so you can do fun activities like have them do a photo scavenger hunt, go outside to play sports, or have students do role-play activities in the class. If you work full time in some universities, they will offer you a visa, accommodation, and maybe even free Chinese lessons. Plus, it’s a good resume builder. Materials: Students will probably have a textbook for your class, and you can also make PowerPoint lessons or show videos through a projector. Expected Salary: 250-350 RMB/hour if not full-time; 15,000+/month if full-time unless they’re providing your accommodation and visa, then it’s less. Visa: You’ll only get a working visa if you work full-time. Most teachers working at universities are doing so on a business or tourist visa. Working at a training center has its perks – dinner out with a bunch of ladies! Overview: As more and more Chinese are trying to learn English, there are tons of private companies out there. Some are good, and some are terrible. Just make sure you get all the information you need before making a decision. Most training centers are either focused on kids or adults. From personal experience, I can recommend Wall Street English, as it is a foreign-owned company with foreign management. Dealing with Chinese management can be difficult for many foreign teachers, so WSE is a good option for avoiding that. Plus, they have room for development, so you can actually turn your one-year teaching fling into a full-time career if you end up enjoying it. A similar job can be found with WSE’s biggest competitor, English First. They are a great company to teach with as they provide support for moving and getting set up in China. Plus, they will help you get your working Z visa which can be a huge hassle. Visa: You’ll definitely get a working visa if you sign up with one of these companies. Keep in mind, however, that you’ll probably have to do the paperwork in your home country. Holidays: As mentioned above, they’re not very good. That being said, at least you get paid for your annual leave, as well as the Chinese holidays. As a part-time teacher, that means about 15 days of paid holidays and 20 for full-time. You can also take an unpaid break in between contracts if you like. 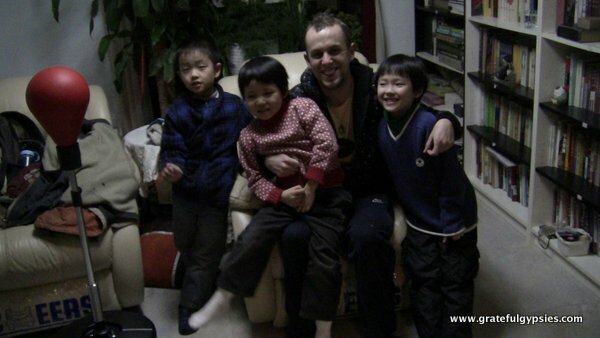 My private students in Beijing. Overview: Of course, you’re always free to find your own students and tutor them privately. Many parents are looking for English tutors for their little emperors and empresses, and plenty of adults want a tutor as well, to improve their English for travel or work. Doing this kind of work can be great, as you arrange the place and time, you have no middleman, and you’re teaching only one person or a small group. However, it’s not stable at all. People cancel or try to make changes at the last minute constantly, and it’s not uncommon for a student to decide they don’t really want to study English after just a few lessons. It’s a good way to earn some extra cash, but it’s hard to make this sustainable as a full-time job. Class Hours: You’ll usually arrange for private tutoring in the evenings or on weekends, and most classes are between one and two hours. Expected Salary: If you’re traveling to be there, you should charge 250-350 RMB/hour. If they come to you, you can knock a little off. If it’s a group of children, or you’re teaching something more advanced, it’s all right to ask for more. If they can afford to have a private English teacher, it’s probably not a big deal. Visa: There’s no way you’re getting any kind of working visa to be a private tutor. This must be a side job. Holidays: You take them whenever you want, and sometimes when you don’t! Some of you may be wondering about accommodation. While some jobs do in fact provide accommodation, we’ve never had one. Sasha’s first job included a place to live, but the contract was terrible and he quit a few weeks in. Especially in smaller cities or more rural areas, you can expect your school to provide you with a simple apartment. We’d personally rather get paid more and find our own place to live, but that’s just us. Many jobs will provide a loan upon your arrival. They will then deduct a certain amount from your salary each month until it is paid back. Our guide on how to find an apartment in China will help you figure out how to find your own place. Keep in mind that this guide is based on our experiences, which have been primarily in Beijing and a little in Kunming. There are definitely differences between the mega-cities and smaller cities, and even bigger differences between these and rural areas. If you’re still on the fence, we’ve got 10 reasons to teach English in China. We’ve also written up descriptions of all the major jobs we’ve had – Sasha and Rachel.